Every Thursday beginning May 19th through September 1st, from 5 pm to 8:30 pm, the best fresh produce California has to offer will be available for purchase. 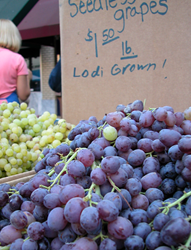 A beloved Lodi summer tradition, Lodi’s Certified Farmers Market returns in May, under the leadership of the Lodi District Chamber of Commerce. Every Thursday beginning May 19th through September 1st, from 5 pm to 8:30 pm, the best fresh produce California has to offer will be available for purchase. Residents and visitors can also grab a bite, order a drink, meet-up with friends or make new ones in a laid back family friendly atmosphere located in Downtown Lodi. The Farmers Market will also have free bike valet available during the market. Visit Lodi! is the official source for information and help in planning a trip to Lodi, California. For more information, http://www.visitlodi.com or call (209)365-1195.